Migration of the Serbs is a subject with a complicated history. A painting with this subject was commissioned by the Serbian Patriarch Georgije Branković to be exhibited at the Millenial Exhibition held in Budapest in 1896. This subject was appropriate because it concerns the migration of Serbs in the late seventeenth century from Kosovo, where they had lived for centuries, to a region called Vojvodina. Vojvodina (today, mostly in Serbia) at that time was inhabited mainly by Hungarians who had lost much of their former territory to the Ottomans. 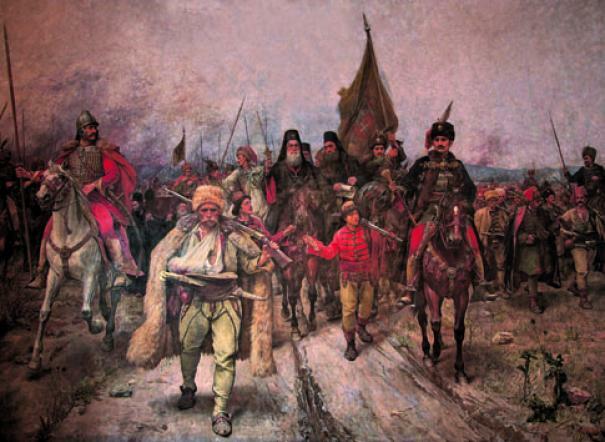 Jovanović painted the subject showing the various groups forced to move in order to escape retribution by the Ottoman Turks (who threatened the eastern border of Europe for centuries). Jovanović shows the Serbs being led by the Patriarch at the time, Arsenije III. The migrants include men, women, warriors, and sheep. Branković rejected this treatment of the subject because he felt it portrayed Serbs unjustly as desperate and pathetic exiles. The Serbs, at the request of the Austrian Emperor/Holy Roman Emperor Leopold, had valiantly defended the eastern border, but when they requested reinforcements from Leopold, they were not sent. He did send them an edit permitting them to settle in Vojvodina and to establish a capital on the Danube at Sremski Karlovci (80 kilometers north of Belgrade). Branković felt a more dignified presentation of the subject meant excluding women and sheep and including the edit, carried prominently by the priest to the left of Arsenije III. Unfortuately, Jovanović did not complete this second version in time for the 1896 exhibition.